Fashion! Turn to the left, Fashion! Turn to the right, Ooh la la fashion! No where in the world is this more appropriate than in Paris, the fashion capital of the world. Parisians are renowned for their style and fashion forwardness, after all, this is the city that founded “haute couture”. From the ateliers of Chanel and Yves Saint Laurent to the flagships stores of Louis Vuitton and Cartier on the Champs-Élysées fashion is everywhere you look; the streets of Paris are truly paved with style. 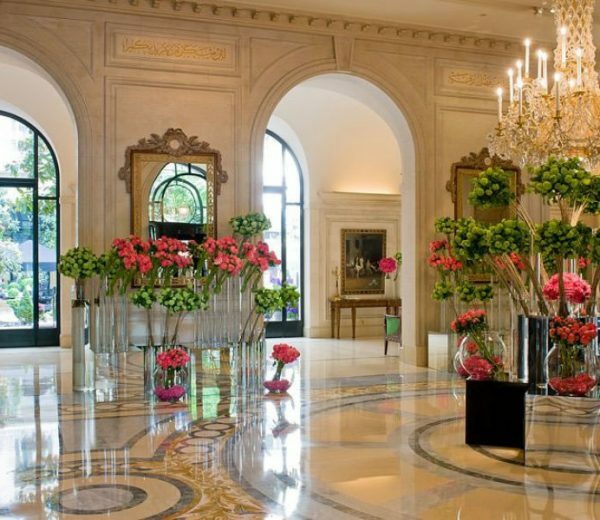 So where else would this fashionista stay than Four Seasons Hotel George V when looking for that much coveted injection of a la mode de la Paris? 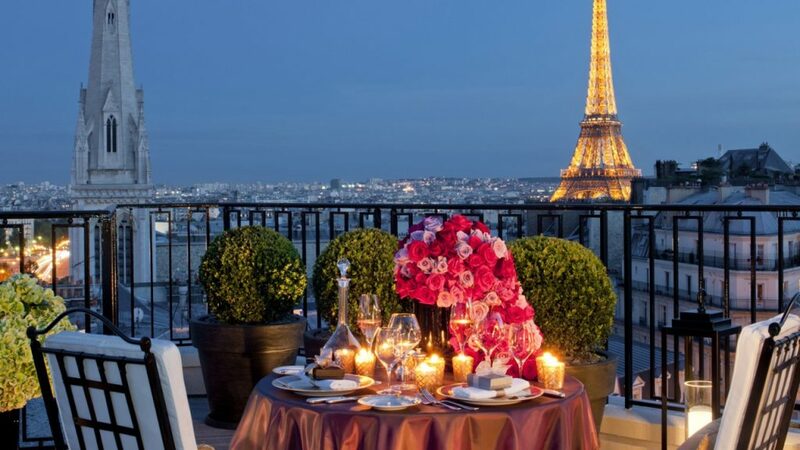 Paris, the City of Light, is forever associated with romance, food, fashion and numerous iconic sites such as the Eiffel Tower, Arc de Triomphe, Louvre, Bastille and many more. The entire city is a pleasure for the senses, but its beating heart is the Eighth Arrondissement, the pride of the Right Bank, where the city’s grandest boulevard, the Champs-Élysées, links the Arc de Triomphe with the ancient obelisk of the Place de la Concorde. 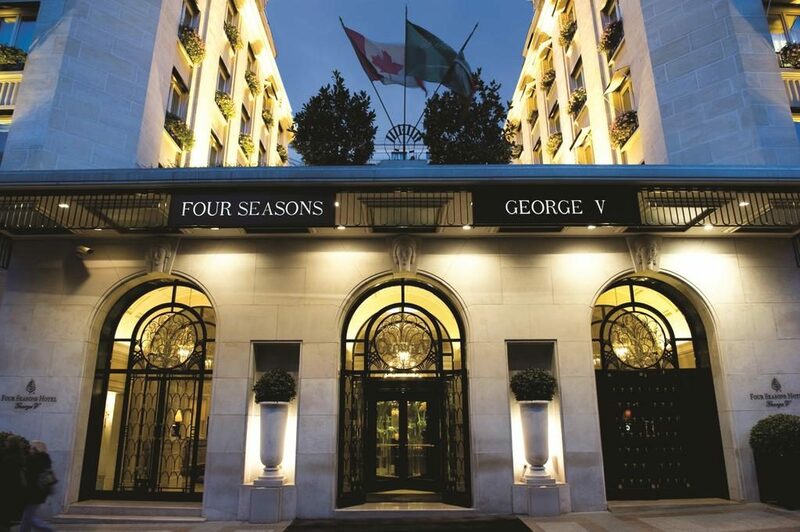 Many of the city’s finest restaurants, shops and gourmet purveyors are found here, so is Four Seasons Hotel George V named for the opulent avenue on which it sits. 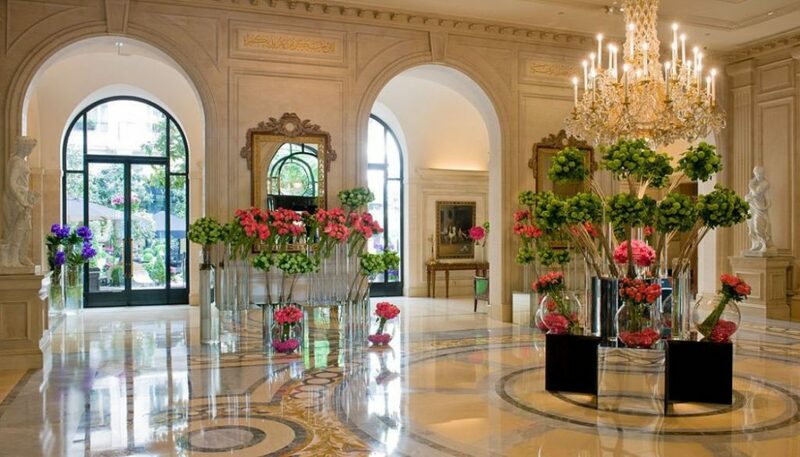 Located just haute couture stiletto steps from the Champs-Élysées, home to the top French connoisseurs of fashion, the hotel is an eight-storey landmark built in 1928, offering 244 luxury hotel guest rooms, an exquisite art collection and decedent Michelin star dining at Le Cliq restaurant. Rachel, my travel partner on this trip, and I arrive at Four Seasons Hotel George V in our blacked out chauffeur driven car after lunching at the elegant Le Dali at Le Meurice Hotel, arriving like celebrities cloaked behind large sun hats and Chanel sunglasses we glide through the revolving door and into the grand lobby. 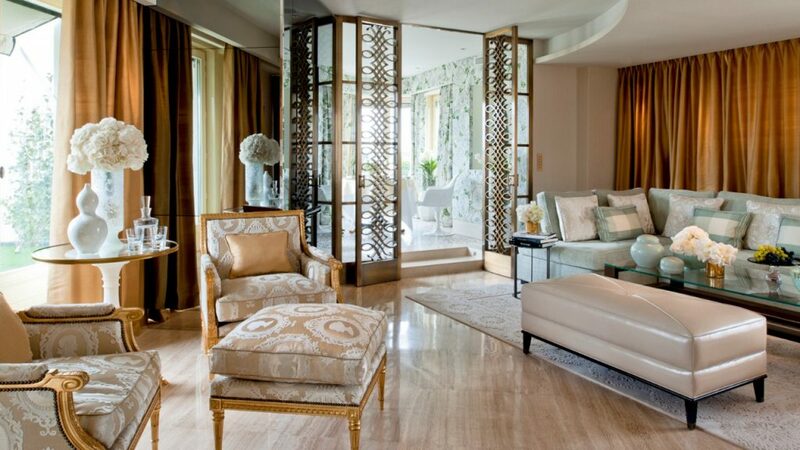 The lobby, bathed in sunlight from the windows to the courtyard, is exquisite, white marble, gilt gold, adorned with flower arrangements filling the space with a sweet scent. At reception we meet the adorable Bertie and Andre, and I say adorable as they were our saviours after we realised a certain International Editor and Lady about Town had left our passports in the safe of the previous hotel. These wonderful gentleman went above and beyond for us and rescued our passports from the Sofitel and had them couriered by car to the hotel and then personally delivered to our room, now that is first class service! While waiting for our passports to arrive, knowing they were in the capable hands of Bertie and Andre, Rachel and I retired to the Le Bar, the “rendezvous incontournable” for both residents and Parisians and a much needed watering hole for us fashionistas where we could take a break from our strappy stilettos at a comfy bar seat. 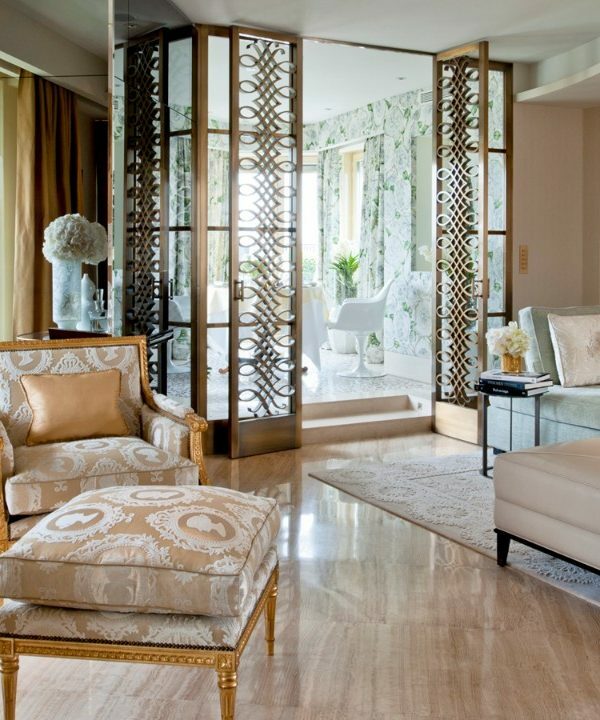 Whilst sipping our champagne Andre appeared to say our room was ready, we made our way across the lounge to the elevators and up to the eight floor, home to the Penthouse and grand suites of this plush Parisian hotel. Entering the suite Rachel and I were struck breathless by the décor and design, it felt like we had left Paris and entered the Palace De ‘Versailles. Dressed in dulcet tones of blue, cream and gold with chandeliers of exquisite glass and baroque furniture the suite was truly magnificent, however, as with all Four Seasons hotels, practical as well. There is an office space with writing desk with connections as to wired or wireless Internet access, multi-line telephones with voicemail and an espresso machine, all one would need were you here to conduct business. The bathroom was equally a grand affair with marble bath and walk in rain shower both with Bvlgari products, his and her sinks and a separate WC all located through a walk in closet. 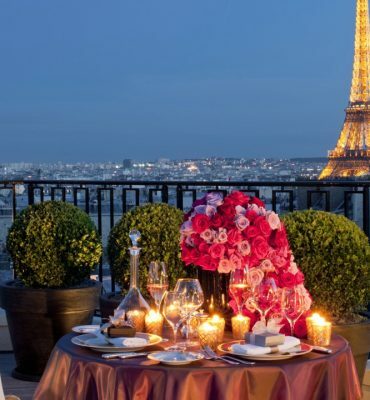 But the crowning glory to this room was located outside, through the grand floor to ceiling windows was a wrap around terrace with a table for two and sun-loungers overlooking the vista of the Eiffel Tower and beyond, si magique! After unpacking, and storing the passports NOT in the safe, we donned our causal summer dresses and wedge sandals and headed to the Champs-Élysées, it was time for a fashion frenzy Parisian style. Gliding in and out of the boutiques and flagship stores from Louis Vuitton to Cartier it was clear to see why Paris is so stylish, even the doormen looked like they had just walked off a catwalk. The rue was teaming with modelesque men and luxurious ladies strutting their stuff as if the pavement was a runway, with Pavoni in hand, Rachel and I joined the urban fashion show and headed to the Arc de Triomphe for a little sight-seeing. The Arc de Triomphe is one of the most famous monuments in Paris, standing in the centre of the Place Charles de Gaulle at the western end of the Champs-Élysées. The Arc de Triomphe honours those who fought and died for France in the French Revolutionary and the Napoleonic Wars, with the names of all French victories and generals inscribed on its inner and outer surfaces. The Arc is located on the right bank of the Seine at the centre of a dodecagonal configuration of twelve radiating avenues and as such the view from the top of the Arc is astonishing with full 360 views of Paris from the Eiffel Tower to Grande Arche de la Défense. 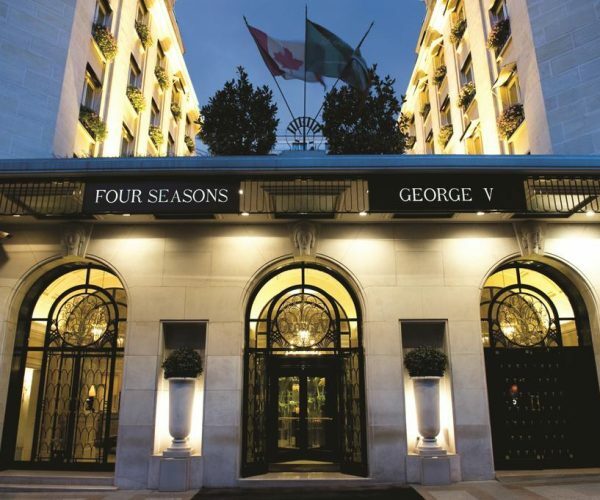 After our fill of culture and laden with bags from our successful (unsuccessful for my credit card) day shopping we headed back to the haven of the Four Seasons George V only to be greeted by hoards of fans and press with cameras. Now this hotel has seen many a celebrity from silver screen to international diplomat grace its floors but it seemed Rachel and I were sharing the 8th floor with both, and after an encounter in the lobby with said individual I think I can safely say both of us “Will be back”, for the staff of Four Seasons treat all guests with such celebrity status whether an International Editor or a Hollywood Icon. 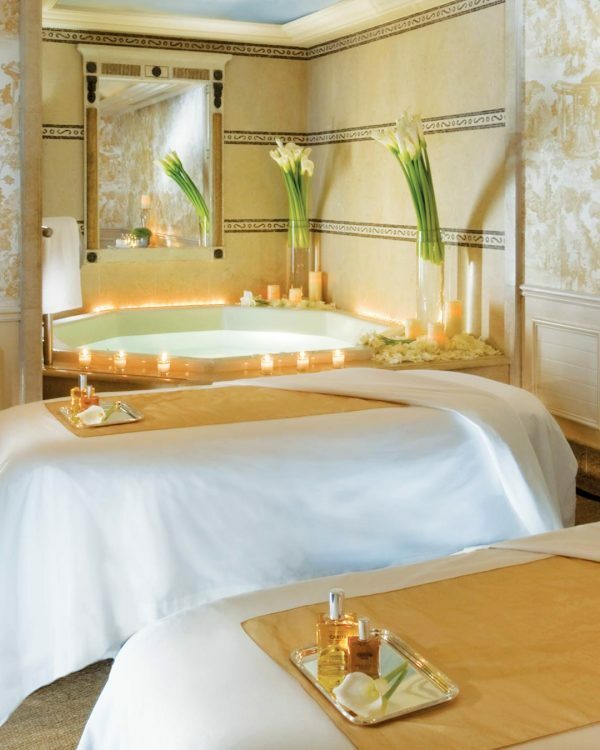 After a heavy day sashaying on the Champs-Élysées it was time for this International Editor to hit the Four Seasons Spa. Located in the lower floor of the hotel this luxurious spa offers saunas, whirlpools, a beautiful mosaic floored indoor pool and a comprehensive menu of body treatments. Today I was to experience the Fashionista Foot Soothing Treatment part of Fashion Week Feet with Four Seasons. If ever there was a time to put your best foot forward it is in Paris, but the constant running from boutique to boutique in Jimmy Choos, Blahniks and Louboutins takes its toll on trendy tootsies. This year Four Seasons has come to the rescue with speedy and effective foot treatments from New York to London and Milan to Paris. 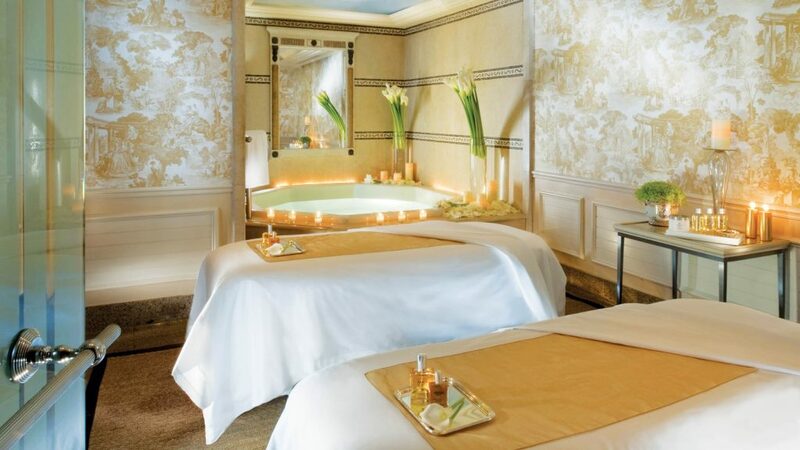 Four Seasons Hotel George V’s treatment is the Fashionista Foot Soothing Treatment which is a welcomed respite for aching feet especially after a long day shopping. The treatment includes stretching movements followed by the application of Sodashi’s Mint Soother Foot Treatment and hot towels to restore the flow of circulation to the feet and lower legs. Only 30 minutes long but very effective, my feet were greatly appreciative of such a treatment and felt soft and renewed. The treatment room was well proportioned and my therapist, Igor, was very informative and made me feel very comfortable, a very relaxing yet opulent spa. After a dip in the pool Rachel and I retired to the suite, pampered and pristine with rejuvenated pins. On this particular night we did not have dinner plans, so we decided that we should make full use of our stunning terrace, especially in balmy August with the city all a glow at night and because the lovely people of Four Seasons had left me a gorgeous late birthday present of a bottle of Billecart Salmon Rose and the largest mille-feuille I had ever seen. Sitting back on our terrace with an array of French cheeses and baguette, sipping our champagne, we soaked up the warm fragrant summer air taking in the night panorama of the cityscape. The Eiffel Tower omitted light like a beacon, shimmering in the deep purple sky, then as if by magic at midnight, like flash cameras on a runway, the monument started to twinkle. Here at the beautiful Four Seasons George V, on my own catwalk highlighted by the glow of the Eiffel Tower, I realised how fashion is passion in Paris, for it is the heartbeat of this city with the veins of rues like the Champs-Élysées which keeps it beating.